Most Christians want a stronger walk with the Lord, but unfortunately, we live in a world that increasingly chips away at our faith. 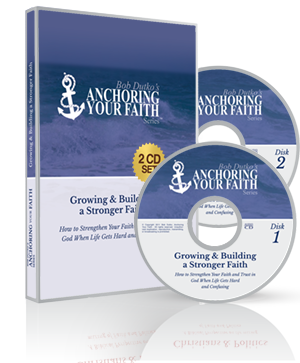 In this 2 CD set, Bob Dutko will lay out in very simple and basic language what we as Christians can do to grow and strengthen our faith and not be swept away and discouraged by all the trials and troubles of life and this world. How do we handle the times when God doesn’t seem to make sense? Or be fair? Or even seem to care? How do we process this and actually grow in our faith during these times? How do we know what parts of the Bible we’re supposed to take literally versus what parts we can see as merely metaphor? What does it even mean to be a true Christian today? What are the areas of Scripture we all must agree on? What about all the differences between denominations and differing beliefs on things like drinking, tattoos, end times, speaking in Tongues, alcohol, politics, and on and on and on? These are all tough questions Christians grapple with that can complicate our walk. Add to them all the other things about our faith that can get confusing sometimes and before you know it, we stop growing stronger in the Lord…..and in some cases, even go backward. How do we stop this? How do we stand firm in our faith, unwavering, “anchored”, and then, become even stronger in our faith? That’s what this 2 CD Set addresses in great detail. Bob Dutko uses his own experiences of unimaginable trials, pain and confusion along with his popular communication style of translating complex issues into simple, everyday language to lay out an easy to follow, methodical plan of action for building and growing your faith…..no matter what’s going on around you. The Authority Of Scripture – What’s Literal? What’s Allegory? Negotiables Versus Non-Negotiables – What’s Okay to “Agree to Disagree On”? Examining Our Primary Identity – Is it Really in Christ?